Home > Blog > Are you tired of looking at your ugly pool and considering pool demolition? We all know the story of The Ugly Duckling. A bird that thinks it’s a duck realizes it’s actually a beautiful swan. In real life, however, sometimes things are just ugly and no amount of waiting or hoping will change things. It’s best to remove them and start over. For instance, if you are tired of looking at your ugly pool, it’s time to fix the situation. Many of the older fairy tales are filled with stories of how the handsome prince swoops in and saves the princess. If you’ve noticed, some of the newer stories now feature strong, brave heroes and heroines that discover their own courage and save themselves with a little help from some interesting friends along the way. You can take matters into your own hands as well. Get rid of that ugly pool with help from the Mikula crew and our pool demolition services. What are your options when tired of looking at your ugly pool? Keep your existing pool – sometimes, all an ugly pool may need is a facelift. Factors like missing grout and old plaster can make your pool look old and hurt your feet. Renovation efforts could involve new tile, new steps, refinishing the interior, replacing old and worn out liner or improving the decking. Replace your pool – the kinds of pools you can get today may surprise you. Tanning ledges, hot tubs, swim jets and infinity edges are just the tip of the iceberg. You can add these features with a new pool. Add features to increase enjoyment of your pool – just beautifying your pool could make all the difference. Extras like waterfalls, water slides for the kids and extending the depth may extend the usefulness and enjoyment of your pool for the entire family. Decide which problems are causing stress you and correct them – it may be the little things that cause the biggest headaches. Something as simple as scale lines can make you want to start over. However, you can remove this issue without harsh scrubbing or dangerous chemicals. You can typically complete this in a day. A complete beauty overall – the concrete deck around you pool might be stained or just not what it used to be. An overlay, new color or stamping might solve these problems. In addition, adding texture, waterproofing and color can create visual elements you may not have thought of before. Look at the big picture – it may not be the pool itself, but the surrounding area that causes you displeasure. A new coating for your deck or beautiful pavers to walk on could make you fall in love with your pool all over again. For example, just adding space for entertaining could make all the difference. Choose stone or other materials to add to and enhance the overall look of your pool area or outdoor space. Get rid of the pool – when cleaning or cosmetic changes still don’t change your mind, then it’s time to get rid of that ugly pool. However, just covering it up is not the way to do it. This leaves rainwater with nowhere to go and you will be left with a mucky, unpredictable mess. You must hire trusted, trained professionals to handle your swimming pool demolition safely and correctly. 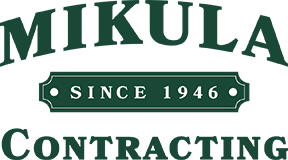 Mikula Contracting will handle every step of the process, from contending with permits and inspections to ensuring that the surrounding area receives the proper attention. In addition to this, we are experts in ground, land, and backyard drainage as well as rainwater and standing water drainage and surface drainage systems. We service Essex, Passaic, Hudson, Bergen, Union and also Morris counties. Once considered the ultimate luxury, in-ground pools can also be a source of frustration for many homeowners. Pool demolition may be your only option. The problem is that this will leave you with a big, unsightly space in your yard. Why not get creative and make your backyard the oasis of your dreams? Replace it with a backyard beach. Some sand and a fire pit made from stones will help you convert the area into your favorite backyard destination. Transform the space into an outdoor theatre. This only takes a large flat surface to use as a screen (a white sheet or tarp can do the trick), a projector, some seating and you are officially in the movie business for your friends and family. Build a cool, sunken pit seating area. You can hire a designer to make an awesome outdoor leisure space. Create a garden retreat. You can fill it with either wildflowers or container plants, possibly both. You could also make it like a little garden village, complete with tiny cottages and benches for a touch of whimsy. Construct a giant game area. You can get really inventive and craft a huge Scrabble game or use rope and string to build a maze for the kids. Create an obstacle course or use some plastic for slip-and-slide water fun in your backyard. The possibilities are endless. Make a patio. You can use cement or slate tiles, paint them, and design an attractive space that is perfect for entertaining.